The City of Richmond Archives holds records created by Council, its committees, and municipal departments involved in guiding land use in Richmond from the very earliest town planning discussions to recent zoning bylaws. Before the post World War II growth of suburban development, the local government role in guiding land use was largely carried out through building and subdivision approval. In Richmond, the first subdivision plans approval bylaw was passed in 1908. The Archives holds a variety of early subdivision plans. After World War II the need for formal planning and building control became more pressing; land was being subdivided and buildings were being constructed at an increasing rate. 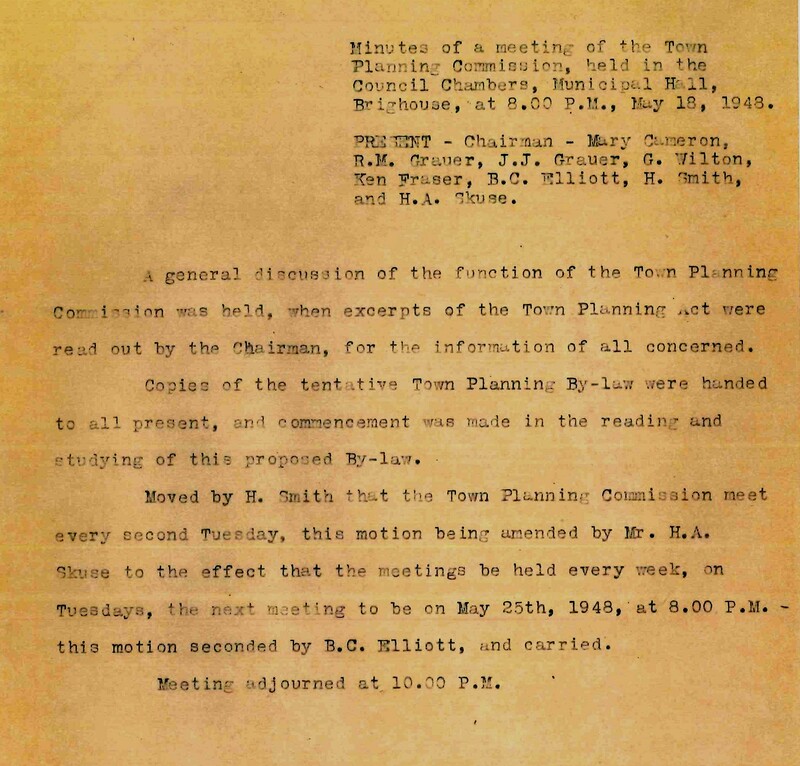 In 1947, Bylaw 1071 was adopted establishing a Town Planning Commission to advise Council in carrying out the powers and provisions of the provincial “Town Planning Act” (1925). 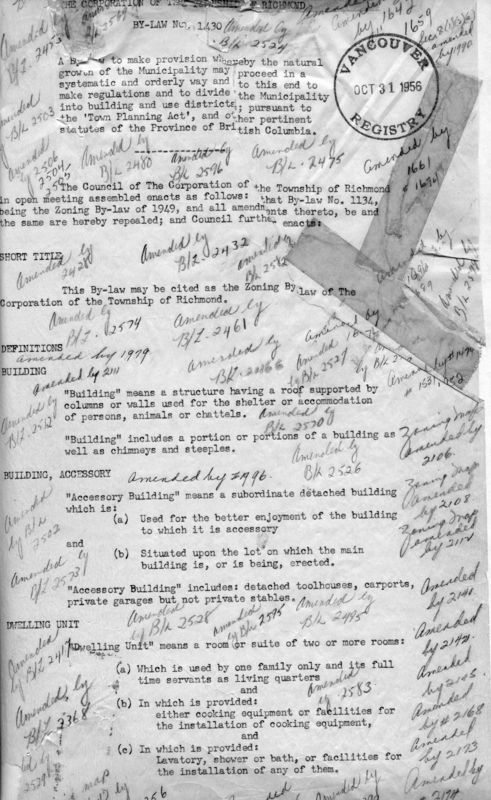 The Archives holds the original minutes and reports of the Town Planning Commission (1948-1957), and its successor body, the Advisory Planning Commission (1958-1991). As evidenced in the early meeting minutes, the Town Planning Commission was empowered to issue or deny building permits and to make decisions relating to permissible activities on specific properties. The Commission was assisted in its decision making by the Municipal Engineer and the Municipal Clerk. 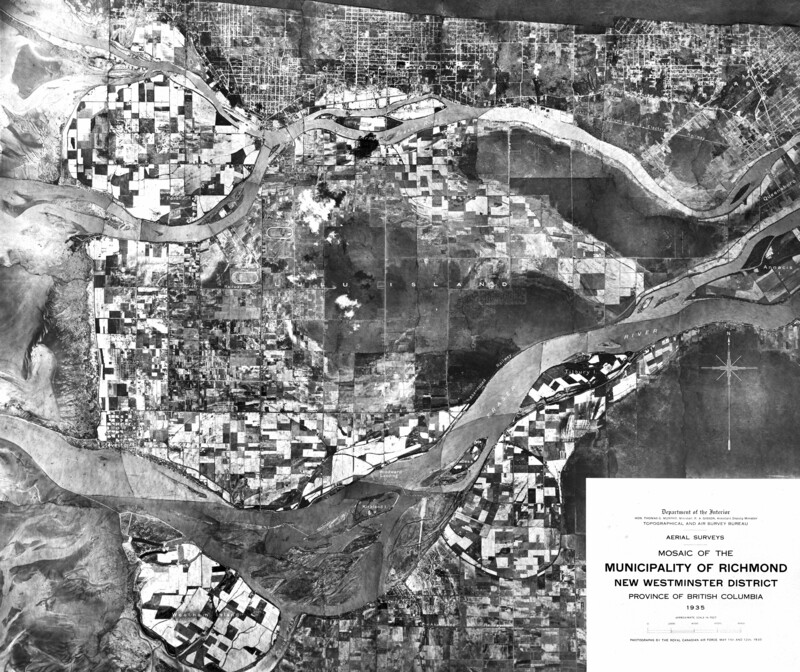 With the help of the provincial government’s Regional Planning Division, a comprehensive planning tool was developed in 1949. 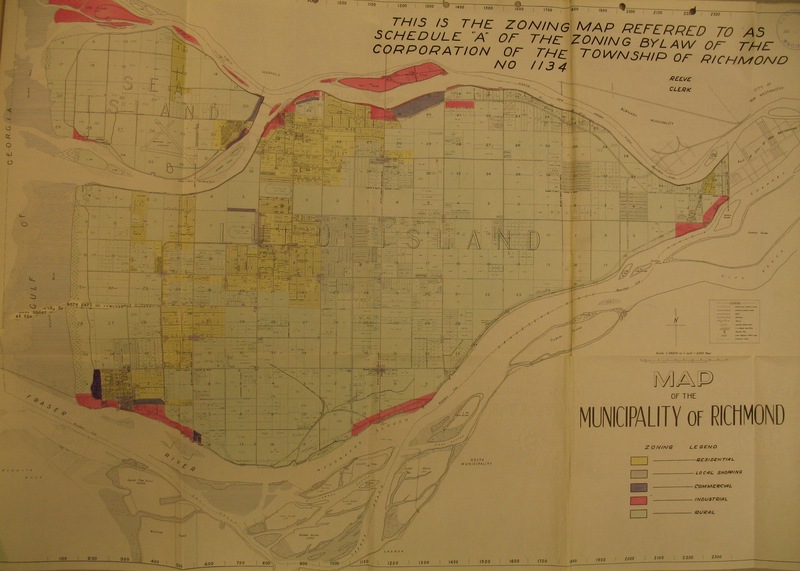 This was the first zoning bylaw, Bylaw 1134 (1949), for the regulation of land use and building, in 7 types of districts, known as the Town Plan. 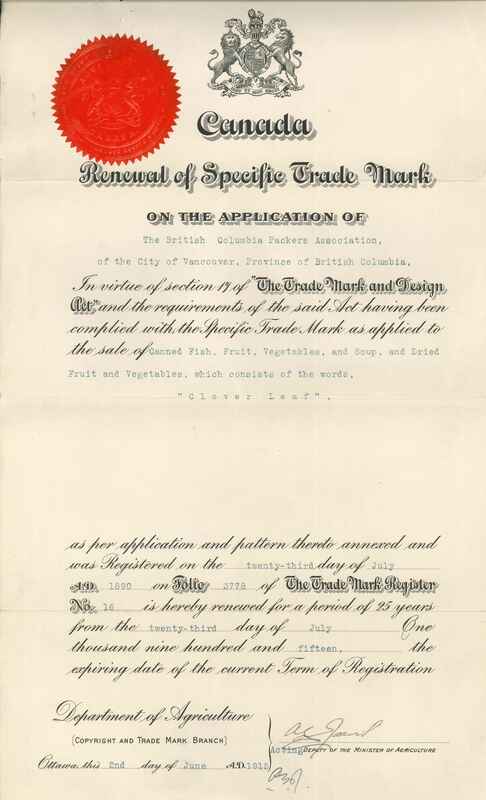 The bylaw was officially described as: “A bylaw to divide the Corporation of the Township of Richmond into districts and to make regulations in relation thereto, regulating the location, use and height of buildings, size of yards and other open spaces, and the use of land, pursuant to the ‘Town Planning Act’ and the ‘Municipal Act’”. 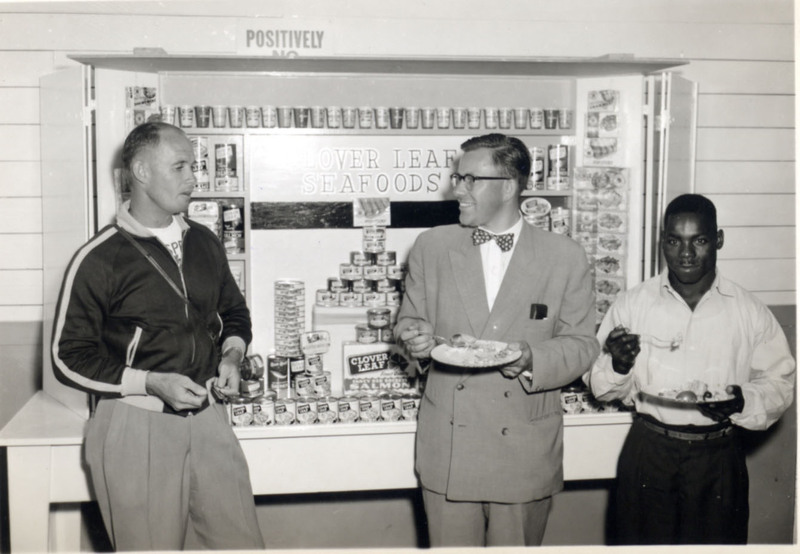 Until 1957, when Richmond’s first Town Planner was hired, Council’s oversight of the planning process was carried out through the Town Planning Commission and outside consultants. 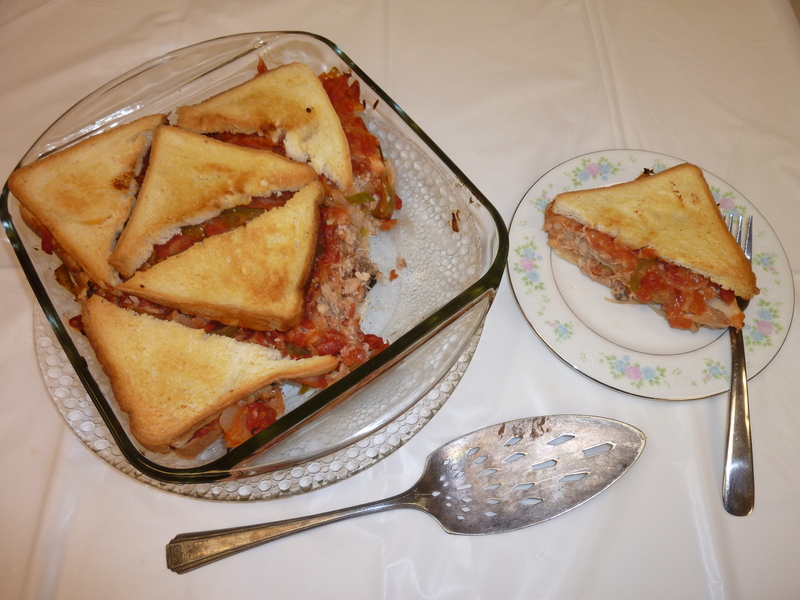 This mechanism proved inadequate to manage growth. 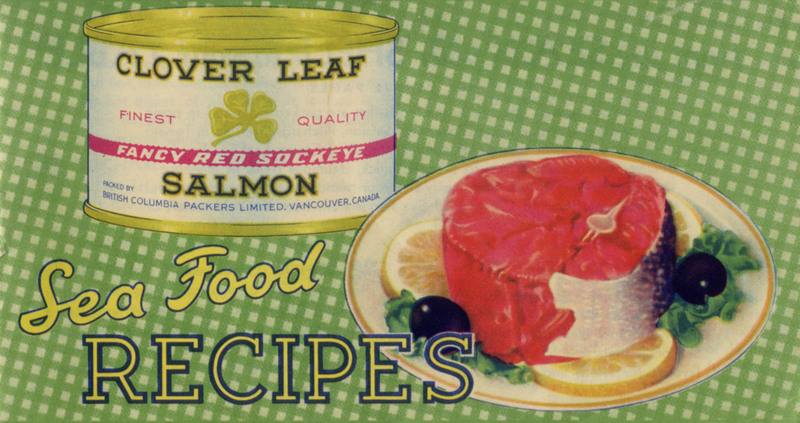 In 1955 consultants presented a report which became the basis for the next zoning bylaw, to replace the 1949 bylaw. Zoning Bylaw 1430 (1956) created 11 use classifications. With multiple amendments (over 1000), it served to guide land use control in Richmond until a new Zoning Bylaw was adopted in 1989. The new 1989 bylaw (Bylaw 5300) was established in association with Richmond’s Official Community Plan, first adopted in 1986. Bylaw 5300 was repealed with the adoption of the present Zoning Bylaw 8500 in November, 2009. The Archives holds extensive municipal government records of planning functions carried out since the creation of the Planning Department, including those relating to community planning and zoning administration. 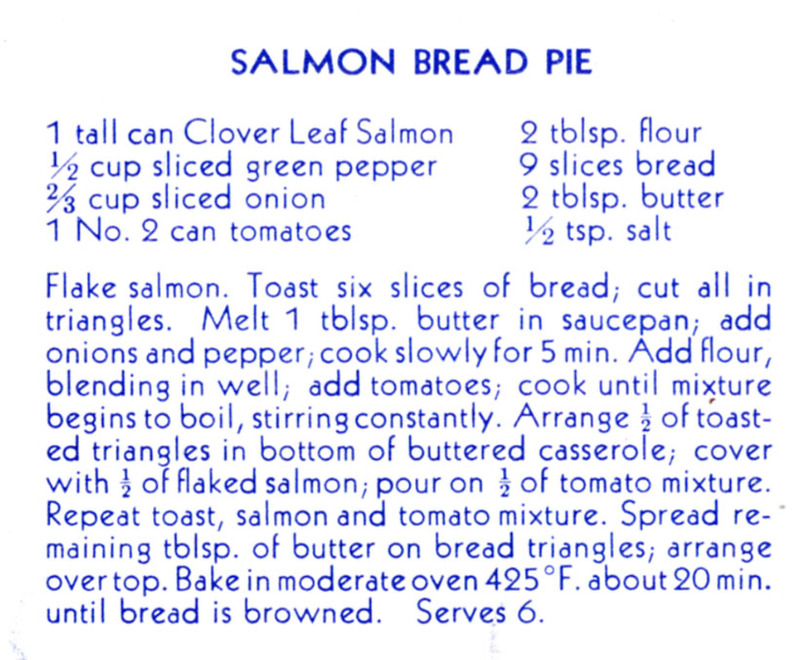 Many people today are surprised to learn that prior to 1981, most stores in Richmond were prohibited from opening on Sundays and holidays. 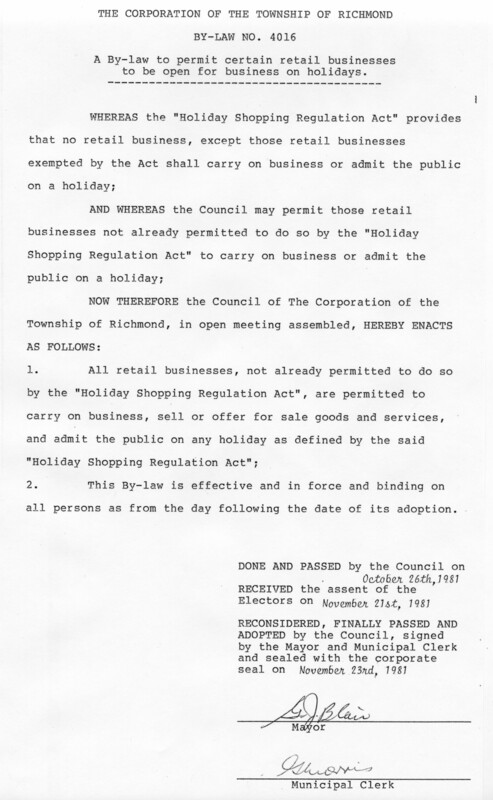 Provincial legislation, namely the Holiday Shopping Regulation Act, was enacted in 1980, and provided a means by which an individual municipality could ask its citizens whether they wished to remove restrictions on Sunday and holiday shopping. Two groups emerged in the community to promote each side of the referendum question, a question that was being asked on a number of municipal election ballots throughout the province. 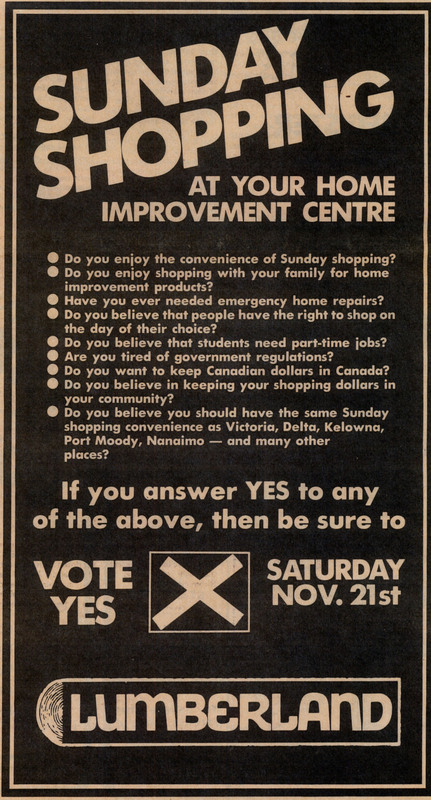 On the other side, some larger, newly-established stores along with a wide-range of citizens argued for the right to shop on Sunday, listing various benefits including convenience, emergency needs, rights of consumers, and promotion of local shopping rather than cross-border shopping or shopping in municipalities which had already adopted Sunday and holiday shopping bylaws. By a margin of 14,434 “Yes” votes to 8,265 “No” votes, Bylaw 4016 received the assent of electors and was adopted by Council on November 23, 1981. Retail shopping on Sundays and holidays was here to stay.